Failed Democratic congressional candidate Jon Ossoff appears to be returning to his early partisan attacks against President Donald Trump. Since Ossoff's June 20 loss, he has unleashed attacks on Trump in a series of tweets and speeches, aimed at rebranding himself as someone that won't pull any punches when confronting Trump on various issues, according to The Atlanta Journal-Constitution. Ossoff, who ran in a special election in Georgia's sixth district in June, was criticized in the last few weeks of his congressional campaign for refusing to attack Trump. Ossoff instead deflected questions about Trump, pivoting back to his talking points about "fresh leadership" and "quality of life." Now, he's hitting the president hard. He was critical of Trump's "both sides" comment following the deadly protests in Charlottesville, Va. He called Trump a "weak and dishonest man" at an awards dinner, and dubbed him "incompetent POTUS" for his response to the hurricane damage in Puerto Rico. "If ever there were an opportunity for statesmanship and leadership and unity. And it's not only the incompetence," Ossoff said Saturday at the Cobb County Democratic Party’s annual fundraiser dinner. "It’s this contempt for the victims and inability to see beyond one’s own ego and vanity that is so disgusting." 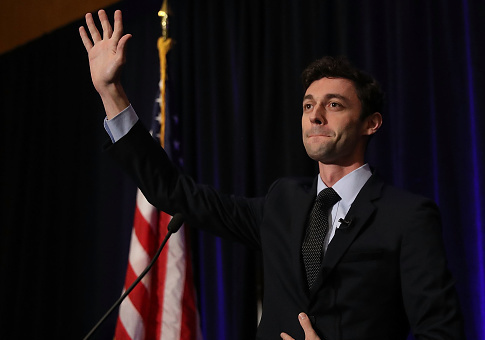 Ossoff, who was unknown in many local Democratic circles, spent the beginning stages of the campaign shattering fundraising records by raising approximately $30 million to become a household name in Atlanta. While he originally ran as the "Make Trump Furious" candidate, he would later back off that strategy. Ossoff's Republican opponent Karen Handel, on the other hand, proudly embraced Trump and any other administration official that would support her candidacy. She would go on to win by a comfortable four-point margin over Ossoff. Conservative group America Rising PAC hit Ossoff on Tuesday with the headline,"Jon Ossoff Robot Reset To Factory Settings." signaling that he is channeling his initial partisan tone by attacking Trump and that he may be running again. Ossoff "scoffed at" running for governor in Georgia, but hasn't ruled out another bid for the House seat in the sixth district, the Journal-Constitution reported. "They're feeling a little nervous, don’t want another big showdown in the Sixth," he told the Cobb County Democrats. "So I say we let them sweat a little longer." This entry was posted in Politics and tagged 2018 Election, Donald Trump, Georgia, Jon Ossoff. Bookmark the permalink.